Inner city areas have the highest number of uninsured drivers, a survey has revealed. West Gorton in Manchester is the worst offender with the number of motorists driving without insurance six times higher than the national average. The survey by the Motor Insurers' Bureau (MIB) named the second-worst district as Barkerend in Bradford. Newtown in Birmingham came third and the Liverpool districts of Everton and Croxteth followed. MIB chief executive Ashton West said: "Together with the police, we will make it increasingly tougher for uninsured motorists in these areas to escape detection. "Now that the police know where the highest proportions of uninsured motorists are, they can focus their resources and make life very difficult for these criminals." Association of Chief Police Officers' spokesman Chief Constable Meredydd Hughes said: "We know that people who do not pay for tax or insurance are often involved in other forms of criminal activity. "By targeting vehicles and focusing police activity in specific areas, the police are able to effectively deal with criminals who use the road." The MIB is a professional organisation for motor insurers. 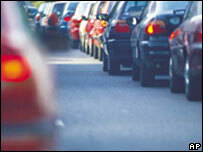 Insurers offering compulsory motor insurance are obliged to be a member under the Road Traffic Act 1988.